LOUISVILLE, Ky. — The federal government has filed suit against 10 people who blocked the entrance to Kentucky’s last remaining abortion facility on Mother’s Day weekend to prevent mothers from murdering their unborn children. The government is asking the courts to create a buffer zone outside of the abortion facility and a restraining order to keep the 10—and anyone associated with them—from obstructing any woman seeking to obtain an abortion. It is also seeking compensatory monetary damages for each person who was unable to utilize EMW Women’s Clinic in Lexington due to their creation of a human blockade in front of the main door. Federal prosecutors in Louisville cite a violation of the Freedom of Access to Clinic Entrances Act (FACE), signed into law by then-President Bill Clinton, as the basis for their request. The statute has both criminal and civil ramifications, but the government is only seeking civil action in the matter. “In bringing this action, the United States alleges that 1) Defendants … have committed, and are likely to continue to commit, violations of the FACE Act, and 2) various persons are being, have been and will continue to be injured, intimidated, or interfered with by the Defendants’ conduct,” the complaint contends. The government’s suit seeks the injunction in light of Operation Save America’s upcoming national event in Louisville, scheduled for July 22-29, as it fears that those participating in the event with the pro-life organization will again block the doors to the abortion facility. However, the Louisville Metro Police Department said that it does not anticipate any issue with the gathering. “They have been very forthcoming about their intentions while they’re here, about where they will be and when they will be there. They’ve gone so far as to invite us to be in attendance at all their events in every case,” Major Eric Johnson told local radio station WFPL. As previously reported, on May 13, dozens of abortion opponents from across the country gathered outside of EMW Women’s Clinic to preach the gospel and stand for life. 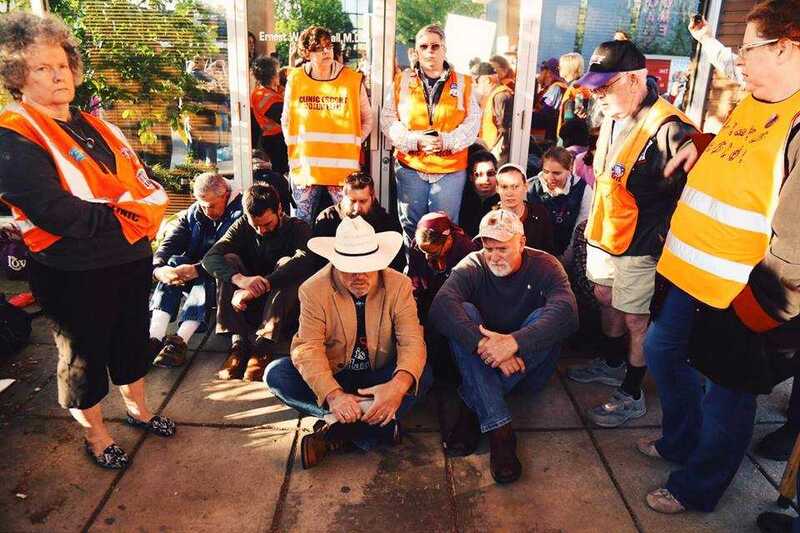 Some of those present, including a pastor, a Holocaust survivor, a missionary and several youth, sat in front of the entrance to the facility, a practice commonly known in the 1990’s as a rescue. Police were called to the scene and witnessed some sitting on the ground in front of the main door to the facility. Rescuers were asked to leave the premises, but refused. Some reports state that they rather linked arms. Operation Rescue/Operation Save America outlined in a statement that those involved believed that preventing murder superseded the consequence of arrest. Police proceeded to arrest those blocking the entrance to the abortion facility. They were charged with trespassing and released. There were 11 arrested, but only 10 names have been released as one was a minor. A trial is scheduled for September. In addition to the federal suit filed this week, the Louisville Metro Council has discussed implementing a buffer zone, but no action has been taken. Joseph Spurgeon, the pastor of Sovereign King Church and a local leader for Operation Save America, denounced the concept on Wednesday during a press conference. “Church-going men and women in Louisville and the surrounding area in both Kentucky and Indiana who come out to plead with women not to get an abortion, who hold signs depicting both the gruesome reality of murder and the beauty of life, and who preach the gospel, are now considered far more dangerous than the ones who are killing innocent children,” he lamented.